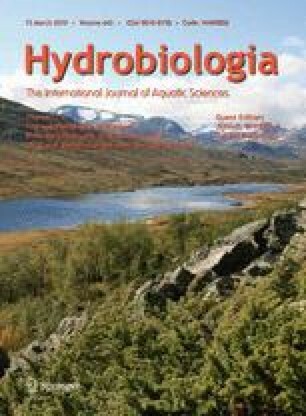 The Holocene lake history, vegetation history and climate history of Brurskardstjørni, an alpine lake in the Jotunheimen Mountains of south-central Norway, are reconstructed. The reconstructions are based on fossil pollen, plant macrofossils, diatoms, chironomids and sediment characteristics. Subsequent to deglaciation, the lake was formed at about 11,000 cal years BP. A diverse chironomid assemblage quickly colonised the lake, whereas the first diatoms were found about 400 years later. At that time, the lake water was turbid with a high pH. The surrounding soils were immature and unstable and dominated by open pioneer vegetation. Compared to the present, summer temperatures were warmer and there was less winter precipitation. From about 10,000 cal years BP, local organic production increased rapidly and from about 9,500 cal years BP a few macrofossils and a high pollen influx of birch suggest that the tree-line was close to the lake. Pine most likely reached its highest tree-line altitude around 9,000 cal years BP and has receded since that time. From about 5,000 cal years BP, the total amount of trees and shrubs decreased and the landscape became more open, probably due to decreasing temperatures and increasing effective moisture lowering the birch tree-line. Coinciding with a cooling during the last 3,000 years, lake-water pH decreased. There is large incongruence between the Holocene July temperatures inferred from pollen and chironomids. The biological proxies responded to a combined effect of environmental change and biotic interactions. This response is interpreted with reference to taxon–environment relationships in the modern calibration data sets and with reference to the latent structure and ecological demands of the fossil assemblages. We wish to thank Øyvind Lie, Svein Olaf Dahl, Helle B. Urheim and Kristine Fjordheim for help in retrieval of the sediment core and Øyvind Lie for performing the LOI analyses. Parts of the chironomid sorting were done by Karoline Klausen. Einar Heegaard carried out the programming for the depth–age model. Arvid Odland compiled the modern climate data for the lake and for the modern calibration data set. We wish to thank Heikki Seppä and two additional referees for helpful comments. This work has been supported by the Norwegian Research Council (NFR) through grants to Gaute Velle (projects 133462/720 and 178653/S30) and to Anne E. Bjune and Jorunn Larsen through the programme ‘Norwegian Palaeoenvironments and Climate’ (NORPEC: project 133943/420). This is publication no. A 231 from the Bjerknes Centre for Climate Research. Møller, J. & B. Holmeslet, 1998. Program Sea Level Change. http://www.imv.uit.no/annet/sealev/download/sl32.htm. University of Tromsø, Tromsø. Stuiver, M. & P. J. Reimer, 1993. Extended C-14 Data-Base and Revised Calib 3.0 C-14 Age Calibration Program http://radiocarbon.pa.qub.ac.uk/calib/calib.html. Radiocarbon 35: 215–230.